Here are some things that you can start doing Now (enviro Now) to make a difference. 1. Turn off unused lights and appliances. You'll save money but more importantly you'll reduce emissions. 2. Cut your grass using a push Reel mower. This will reduce emissions from your lawnmower's engine. Notice how cars are becoming lower emission vehicles...do you think your lawnmower is designed with these low standards for NOx for example? This not only saves the environment but you won't be breathing in those fumes either. 3. How often do we make things physically easier at home, and then turn around and "work out". Cut your grass using a REEL mower. No this is not a repeat. Use this as your workout instead of "driving" to the gym and all that comes with working out at the gym. 4. Recycle. More things are recyclable than you think. 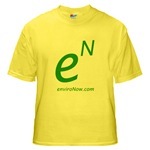 Visit Recycle, Reuse and Reduce on this site. Don't throw batteries and computer parts in the regular trash. 5. Don't litter. Why is this so difficult? 6. Grow your own vegetables. This is great exercise, good for your health. teaches you and your kids about nature. Try it. 7. Stop blaming the oil companies for everything. Take 100% responsibility. 8. Talk about it. Be part of the early majority and pioneers. Word of mouth is the best marketing. Wear one of our T-shirts or put a sticker on your car. Just like any great movement, it takes leadership from within. Be 100% responsible. 9. THINK about where else are we emitting to the environment. Our cars, electricity usage....now think about other things we take for granted. Do you use weed killer on your lawn? Do you pour chemicals down your sink? 10. Look at the earth you are walking on, driving on, living on. Is this how you would treat your house or even your car? In fact, you often leave your house and can even move to a new house if you want. But guess what...you're on this home called earth 24/7 365 days a year. Think about it. If this home has a roof leak, or has engine problems, who are you going to call. Be 100% responsible.